The annual theme park attendance listing, put together by Economics Research Associates (ERA) and now published by the Themed Entertainment Association (TEA) and InPark and Park World magazines, is now out. Once again, Walt Disney World's Magic Kingdom finds itself atop the heap, with 2007 attendance of over 17.06 million visitors. Disneyland Park in California again came in second at 14.87 million guests. Tokyo's Disneyland and Disney Sea parks finished third and fourth with 13.9 million and 12.41 million, respectively. Disneyland Paris saw a huge jump, thanks to new attractions and its 15th anniversary celebration, going from last year's 10.6 million to 12 million visitors this year. Epcot came in sixth at 10.93 million visitors. Disney's Animal Kingdom cut nearly 90 percent of the gap with Disney's Hollywood Studios, closing to within 20,000 visitors. The not-really-a-working-studio park saw 9.51 million visitors, while the "Nah-ta-zu" park had 9.49 million. Ninth-place Universal Studios Japan was again the top non-Disney park, with 8.71 million visitors, while the top U.S. non-Disney park was Universal Studios Orlando with 6.2 million, in 11th place. Disney's California Adventure was again 13th overall, with 5.68 million overall, behind SeaWorld Orlando's 5.8 million. Hong Kong Disneyland came in at number 21 worldwide with 4.15 million, more than a 20 percent drop from last year. Once again, Walt Disney Studios Paris didn't even make the world chart, coming in at number 10 in Europe with 2.5 million visitors, still a 13.6 percent increase from last year thanks to new attractions and the celebration of the resort's 15th anniversary. Attendance grew at most U.S. Disney Parks, with Disney's California Adventure seeing the only drop, of 4.5 percent. Disney's Animal Kingdom again led the increases, with a 6.5 percent jump. Epcot and Disney's Hollywood Studios followed at 4.5 percent. The Magic Kingdom was up 2.5 percent, while Disneyland Park was up 1 percent. Disney parks made up six of the top eight domestic parks, with SeaWorld Orlando sneaking past DCA by 120,000 visitors. The U.S. and world water park rankings again were led by Typhoon Lagoon and Blizzard Beach, at 2.08 and 1.91 million, respectively, up 1.5 percent each. The world's number three water park was Caribbean Bay in Korea, with 1.4 million. Number three in the U.S. and world number four was Wet N' Wild in Orlando with 1.37 million. We welcome back photographic contributor Brian Warneke, who has sent along some construction photos from the Magic Kingdom this week. City Hall is under wraps. Photo by Brian Warneke. Construction walls are up at the Main Street Railroad Station. Photo by Brian Warneke. 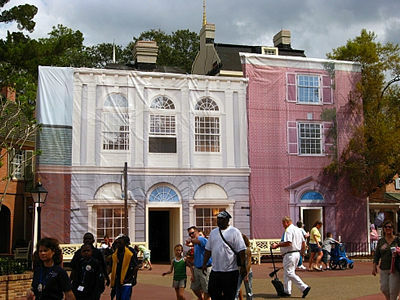 Heritage House, next to the Hall of Presidents, is undergoing some facade work underneath those scrims. Photo by Brian Warneke. Something is going on next to the Frontierland fry cart. Photo by Brian Warneke. 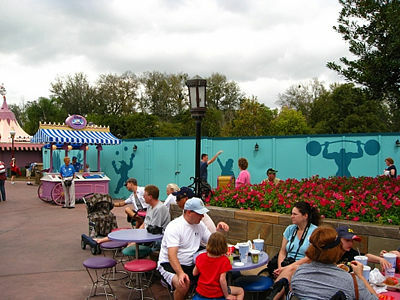 A construction wall behind Dumbo the Flying Elephant features circus-themed silhouettes. Photo by Brian Warneke. 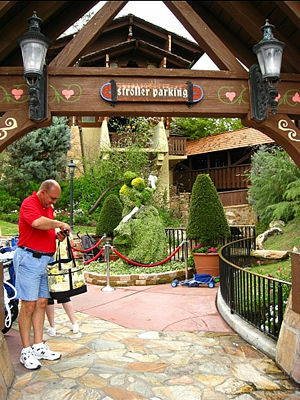 A topiary of Cinderella and her prince decorates the stroller parking area adjacent to "it's a small world". Photo by Brian Warneke. As we reported a couple of months ago, the Fort Wilderness Resort and Campground will be receiving a major upgrade. The announcement from Disney last week confirmed all items that we reported, as well as some additional into. There will be an intensive effort to widen and lengthen the concrete parking pads to address the fact that the average length of a recreational vehicle has increased by 27 feet since the campground opened, many with "slide-out" extensions. New "premium" campsites will be available, featuring not only extra large concrete pads for larger vehicles but also upgrades to existing amenities such as picnic tables and grills. The main pool will see the addition of a themed water slide, a hot tub and a children's web play area. The pool's deep end has also been made shallower. The 409 Wilderness Cabins have all received new furniture, carpeting, fixtures and linens, as well as a fresh coat of paint. There's a new doggie playground at the new Waggin' Trails Dog Park, an off-leash play area. The MousePlanet.com store is now open for business (link)! You can get shirts, mugs, hats and even a Teddy Bear! Check it out and show your MousePlanet pride! The self-service kiosks installed at Pecos Bill Tall Tale Inn and Cafe last June have apparently passed the test and will be made permanent. According to a Walt Disney World press release, the kiosks, "enhance the guest experience by making it easier and more convenient for guests to dine at Pecos Bill’s" and also help cast members, "spend more time engaging with Guests in more meaningful ways." Many argue that it actually allows Disney to redeploy cast members from cash registers to other jobs that may be short-staffed due to the Central Florida hiring crunch in front-line jobs. 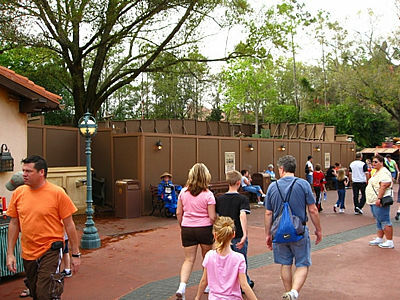 In either case, the kiosks are apparently here to stay, and it's likely that they will start making an appearance elsewhere within the parks. Night of Joy tickets are now on sale for the first running of the event at Disney's Hollywood Studios this fall. Tickets for each night (September 5 and 6) cost $49.95 ($44.95 in advance) for all attendees. Two-night tickets cost $75.95 each. Those prices do not include the 6.5 percent sales tax. The line-up of acts has been announced. On Friday, September 5, the entertainment will include: Chris Tomlin, MercyMe, Rebecca St. James, BarlowGirl, Matthew West, Rush of Fools, Brandon Heath and Britt Nichole. Saturday, September 6 will feature: Casting Crowns, tobyMac, Fred Hammond, Marcos Witt, Mandisa, Aaron Shust, RED and Pure NRG. The Night of Joy is not the only event moving from the Magic Kingdom to Disney's Hollywood Studios, though. In 2009, Disney's Grad Nite will take its leave from the Magic Kingdom, so April 26, 2008 will be the last Grad Nite to be held at the park that it has been its home for the last 36 years. The staff of the Disney Animal Kingdom's breeding program savannah has been busy the last couple of weeks, with two new members of the savannah being born since February 29. A female baby giraffe named Makena was born to first-time mother Malaika on February 29, while a male baby zebra named Kidani was born to mother Kari on March 8. 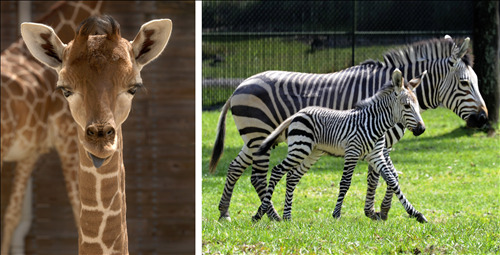 Kidani, named for the Kidani Village expansion of the Animal Kingdom Villas currently under construction, is the first Hartmann's Mountain Zebra born at the resort. The endangered species is native to Angola, Namibia and South Africa. Kidani currently weighs about 65 pounds and stands three and a half feet tall. Makena, which means "Happy One" in Swahili, weighed 118 pounds and stood five and a half feet tall at birth. She is the eighth giraffe born since the opening of Disney's Animal Kingdom in 1998. Both mothers and babies are doing well and are expected to rejoin their herds on the savannah at Disney's Animal Kingdom Lodge in the coming weeks. Makena (in front of mother Malaika), left, and zebra Kidani (in front of mother Kari) are the newest additions to the Animal Kingdom Lodge savannah's herds. Photo © Disney. Help us keep our menu listings up to date! Did you know that MousePlanet now has menu listings (link) for all theme park restaurants at Walt Disney World and many resort restaurants? You can help us keep them up to date! Send your photos, scans or other copies of restaurant menus (no fair copying from other Web sites) to menus@mouseplanet.com (link). Please note that there is a 5 MB limit on total attachments in a single email. On April 27, I'll be walking to raise money for the March of Dimes again. The March of Dimes mission is to improve the health of babies by preventing birth defects, premature birth, and infant mortality. Without therapies, medications and treatment regimens developed under grants from the March of Dimes, my son would not be alive today. So, you see, this is a very personal cause for me. I want to help the March of Dimes in order to help the next baby that's born too soon. Last year, through the generosity of friends, family, co-workers and MousePlanet readers, we managed to raise $4,025. This year, let's beat that. Let's see if we can raise $5,000. I think we can. For more information, or to donate, go here. Boardwalk Resort ESPN Club Back Bar Flooring – Removal of the existing floor and wall base tiles and replacement with epoxy flooring system. Boardwalk Inn Quiet Pool Trellis Rebuild – Installation of a new Quiet Pool trellis that will match the existing architectural details. Yacht & Beach Club Resort Main Building Siding Repairs – Replacement of damaged siding and completion of necessary repairs. Dinoland Games – Removal of existing roll up doors from five game booths, and installion of canvas roll ups. …This year's Twilight Zone Tower of Terror 13K page is now live, though registration has not yet opened. …Disney Magic Music Days celebrated its 2 millionth student performer on Friday, as the Mount Hebron High School Band from Ellicott City, Maryland marched down Main Street, U.S.A. More than 30,000 student groups from five continents and all 50 states have participated since 1985. The selected student and their family were treated to a night in the Cinderella Castle Suite. …The Doubloon Lagoon feature pool at the Port Orleans French Quarter Resort reopened last Saturday, March 8. Thanks to JP for the info. …The Quality Suites near Universal Studios closed down temporarily after two Pinellas County tourists staying there were found to have contracted Legionnaires' Disease. All guests at the hotel were temporarily relocated to other hotels on Friday while the the state Department of Health tested water samples from throughout the pool. It is uncertain whether the hotel was the source of the infection. …The next NFFC World Chapter meeting for Disney Enthusiasts is Saturday, April 12. The guest speaker will be former Walt Disney World Ambassador Mary Ann (Carter) Lunde. For more information, check out the World Chapter's Web site. …Disney has signed a deal with Springs Global US, Inc. to supply Wamsutta products for deluxe and Disney Vacation Club resorts as part of the Disney Resort Collection. The bedding and bath products will be available for purchase by in-room and online catalogs. Products include deluxe bath towels, microtouch fleece blankets, cotton-rich sheets, bed pillows and a mattress pad. Don't keep it to yourself! Send us your news tips, rumors, and comments. Email Mark here. Talk about these stories and more on our Walt Disney World discussion forum here. February 27 - March 29. Atlanta Braves Training Camp at Disney's Wide World of Sports complex. April 1, 4, 6, 11, 16, 23, May 2, 9, 16, 21, 26, 31, June 4. Mickey's Pirate & Princess Party. Apr. 18, 19, 25, 26. Disney Grad Nite. April 26–27. USASF Cheerleading & Dance Worlds. 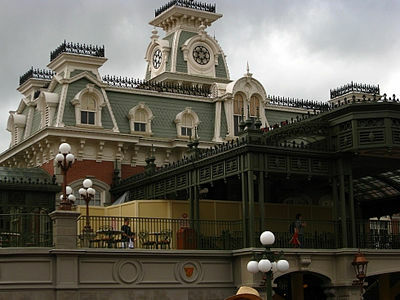 Minnie's Country House – closed for refurbishment April 1–23. 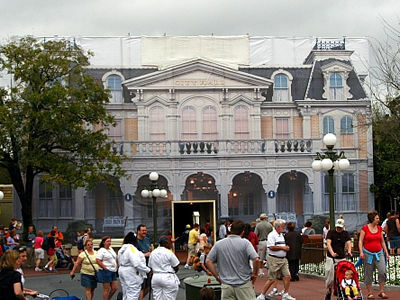 Cinderella's Golden Carousel – closed for refurbishment May 4–24. Jungle Cruise – closed for refurbishment May 11–24. Illuminations – the LED globe is scheduled to be removed from the show for a major refurbishment, possibly in early summer. The length of the refurbishment is not known. The show was tested without the globe on February 27. Tutto Italia Ristorante – is now open, but will close in the spring to be completely remodeled, and will reopen in the fall under yet another new name. The Wonders of Life pavilion – has again closed as such, and most likely will only be used as a Festival Center until a new sponsor is found. Nine Dragons – closes April 6 – November 30 for renovations that include the creation of an exhibition kitchen. Journey Into Narnia: Creating The Lion, The Witch and The Wardrobe – closed for refurbishment and likely conversion to a Prince Caspian theme, January 2 – May 23. Disney Stars and Motor Cars Parade – ended March 8. 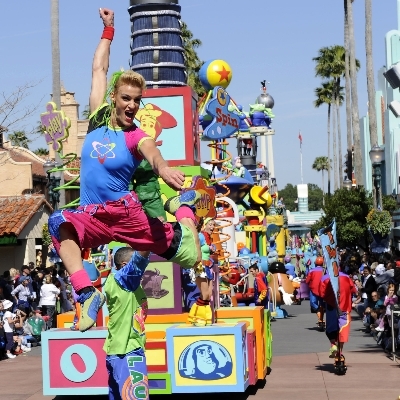 Block Party Bash Parade – preview performances began March 9, official runs began March 14. Mickey Avenue – closed through spring for installation of the Toy Story Mania attraction and related theming. The American Film Institute Showcase – closed for refurbishment April 1 – May 1. "American Idol" – under construction in the soundstage that formerly hosted Superstar Television and Doug Live!. Scheduled to open in late 2008. Animal Kingdom Lodge – Construction of the Kidani Village annex building for the Disney Vacation Club's Animal Kingdom Villas is expected to take until spring 2009. Jambo House construction is now complete. Beach Club Resort – the quiet pool will be closed from March 31 – April 11. Caribbean Beach Resort – Feature pool closed for renovation January 7–mid-September. Temporary "child-sized" slides will be added to the quiet pools in the Jamaica and Barbados Villages while the main pool is closed. Coronado Springs Resort – One side of the Jaguar slide at the main feature pool will be closed for rehab March 31 – April 30. The pool will remain open during the work. Yacht Club Resort – the quiet pool will be closed April 14–21. Cirque du Soleil – La Nouba – performs Tuesdays – Saturdays. T-Rex Cafe – reportedly opens in Downtown Disney in late 2008. For a limited time, MousePlanet discount ticket partner Orlando Fun Tickets is currently offering a free upgrade to a 5-day Park Hopper pass when you purchase a 3-day Park Hopper. Check out the special offer or any of the other great prices on tickets at OrlandoFunTickets.com! Annual Passholder and Florida Resident discounts have been announced for March through May. From March 30 through May 21, room-only discount rates are available, with Passholder rates being anywhere from $5 to $15 less than Florida resident rates. Passholders should use code FJC or FJD for Sunday-Thursday nights, while Florida residents should use FJK. The Passholder weekend rate code during that period is FJG. In addition, the Disney Dining Plan will now be available to Annual Passholders, even on room-only reservations. To add the Dining Plan during the March 30 through May 21 AP discount period, Passholders should use code ANA, and the Deluxe Dining Plan requires code ANC. For other dates that do not have an effective Passholder discount, reservations for the Dining Plan should use code ADS and for the Deluxe Dining Plan should use code ADU. As reported before, Magic Your Way package reservations for stays most Sunday-Thursday nights between March 30 and May 21 will get free upgrades on their base Magic Your Way tickets to include Park Hopper and Water Park Fun & More options. Codes are available for Magic Your Way packages with no dining (APV), basic Dining Plan (APF) and Deluxe Dining Plan (APH). The number of packages available at these rates is limited. Those with existing reservations may be able to modify their reservation if space is still available that their resort for their dates. For ticket prices, park hours, and entertainment schedules, please go here.